Skyfall’s a tough act for Spectre to follow, but nobody could do it better than director Sam Mendes. Skyfall seemingly came out of nowhere. It was supposed to be just another Bond movie, Daniel Craig’s third outing and the installment that marked the franchise’s historic 50th anniversary. Instead, it turned into its own phenomenon, breaking franchise box office records and — briefly — landing at the 007 spot on the top ten list of global box office champions (not adjusted for inflation, of course). Breaking away from the episodic nature of the predecessors, Daniel Craig’s Bond movies are establishing a larger character arc involving childhood tragedy, male aggression, professional obsolescence, technological impacts on tried-and-true analog standards, love and loss all set in a dangerous world of terrorists and espionage. It’s pretty heavy duty stuff for a spy series that’s perpetually underrated as merely a misogynistic male fantasy. Spectre continues that trend of exploring the roots of Bond, James Bond, and it goes so far as to neatly wrap all three of Craig’s previous movies into one overarching shell involving one particularly nefarious villain in the Bond franchise. But, yeah, there’s also a smidgen of sexism (and ageism) at play here. Big news was made in the Bond world when it was announced Monica Bellucci, a 51-year-old Italian bombshell, would be the first 50-something “Bond girl.” Well, Bellucci makes what she can of a very, very small role and she plays second fiddle to a 30-year-old French hottie. Spectre doesn’t top the sublime cinema of Skyfall, but it still ranks high up in the Bond canon. The story picks up shortly after the events of Skyfall. The Double-O program is on the verge of closure in favor of a multinational security network. There’s more talk of how agents on the ground are an out-of-date concept. It’s all about drones and cyber technology. 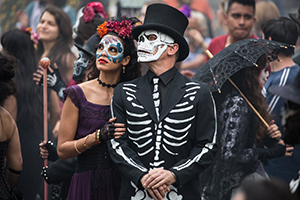 Of course, Bond doesn’t help matters any when he goes to Mexico City and, during the festivities of the Day of the Dead, creates an international incident while attempting to thwart terrorist activity. At the end of Skyfall, there was the sense that Bond was finally moving back to the traditional world of Bond: Miss Moneypenny (Naomie Harris, Pirates of the Caribbean: Dead Man’s Chest) was introduced into the Craig series; the classic Aston Martin from the Connery era made a glorious return (accompanied by Monty Norman’s enduring theme music); a new — and quite young — Q (Ben Whishaw, Cloud Atlas) found new ways to annoy Bond; and a new M (Ralph Fiennes, The English Patient) seemingly promised friendlier terms with 007. Alas, there’s still plenty of darkness to go around as more from Bond’s deep past is revealed. And there’s a strange, mysterious connection between Bond’s legal guardian (following the death of his parents) and a phantom menace leading a secret society that would creep out even Robert Langdon. That’s where a man named Oberhauser (Christoph Walz, The Zero Theorem) enters the picture. International security — and Bond’s life — are at stake. A lot of good storytelling is afoot in Spectre thanks to the returning collaboration of Skyfall director Sam Mendes and scribes John Logan, Robert Wade and Neal Purvis, with the addition of Jez Butterworth (Edge of Tomorrow). Threading together the action in all of Craig’s Bond movies is a slick, cool move and the use of the characters — including Moneypenny as both a Bond mole and a young woman with a life outside MI6 — is well done. But there’s also an odd clumsiness to the two romantic interests. They both go from verbal jousting to another kind of mouth action with alarming speed, even for Bond. But the relationship with Madeleine Swann (Lea Seydoux, Blue Is the Warmest Color) has enough pull to move the series forward. The reward for all that mining of Ian Fleming’s source material is the perfect ending. The door is left open a crack for Craig to return one more time, but it can also serve as the ribbon around the Craig series. Maybe the writing’s on the wall for this Bond. But here’s to hoping he’ll live to die another day.